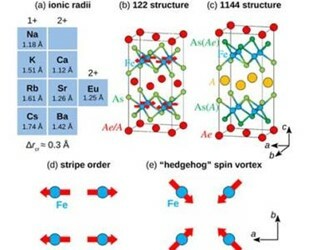 Ames Laboratory produced samples of one of these iron arsenide materials with calcium and potassium, CaKFe4As4, and experimentally discovered that when placed under pressure, the structure of the material collapsed noticeably. “It’s a large change in dimension for a non-rubber-like material, and we wanted to know how exactly that collapsed state was occurring,” said Paul Canfield, a senior scientist at Ames Laboratory and a Distinguished Professor and the Robert Allen Wright Professor of Physics and Astronomy at Iowa State University. Through computational pressure simulations, the researchers learned that the material collapsed in stages--termed “half-collapsed tetragonal phases”--with the atomic structure near the calcium layers in the materials collapsing first, followed by the potassium layer collapsing at higher pressures. The simulations also predicted these behaviors could be found in similar materials that are as-yet untested experimentally. “Not only does this study have implications for properties of magnetism and superconductivity, it may have much wider application in room-temperature elasticity,” said Canfield. Canfield collaborated with Roser Valenti at the Institute for Theoretical Physics at Goethe University Frankfurt am Main, who served as the host faculty member for Canfield’s Humboldt Award in 2014. It has been a delight as an experimentalist to be able to access this theoretical group’s ever-increasing computational skills to model and predict properties,” said Canfield. The research is further discussed in the paper, “Trends in pressure-induced layer-selective half-collapsed tetragonal phases in the iron-based superconductor family AeAFe4As4,” authored by Vladislav Borisov, Paul C. Canfield, and Roser Valenti; and published as an Editor’s Suggestion in Physical Review B.